I was honoured and excited when Walsall Museum invited me to take part in planning this exhibition. 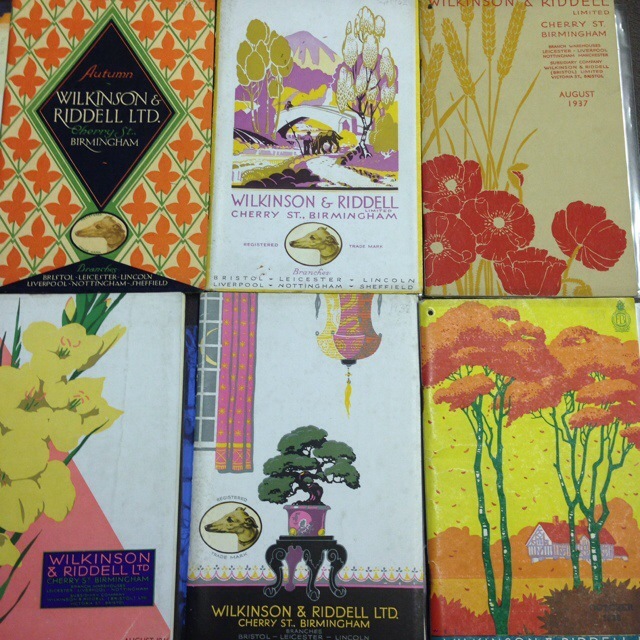 My brief was to select items from the Hodson Shop Collection that told the story of the transition from wartime austerity to the relative prosperity of the 1950s. 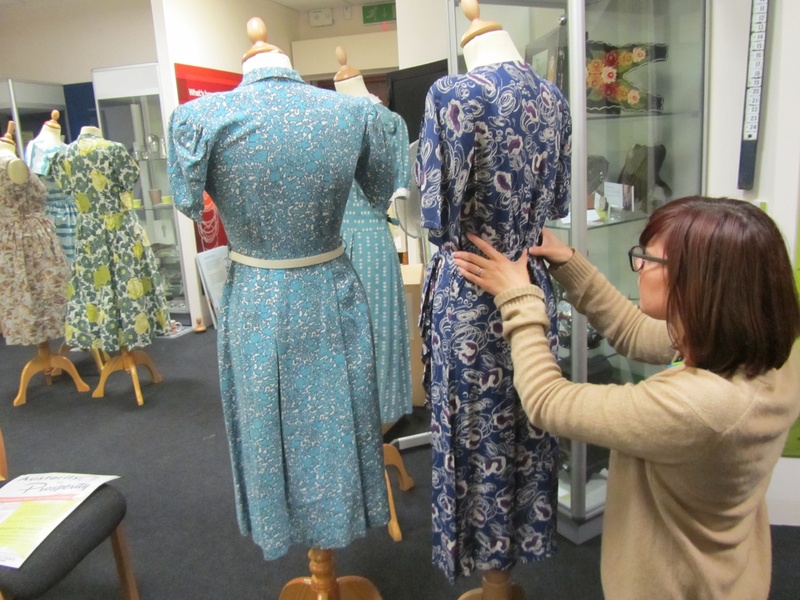 The clothing in the collection fits perfectly within this tumultuous period and provides evidence of what Black Country women were wearing during the post-war period. There are the simple yet subduedly elegant utility (CC41) dresses that fade away as the 1950s get into full swing, with full skirts and vivid prints taking over. My main aim was not to oversimplify the narrative of change; the myth that everyone woke up on 1st January 1950 to find that the drab wartime world had been replaced by a new consumer-driven technicolor dream world. The 1940s may have been a time of austerity but there was still colour, beauty and a booming demand for little luxuries such as lipstick and face powder. 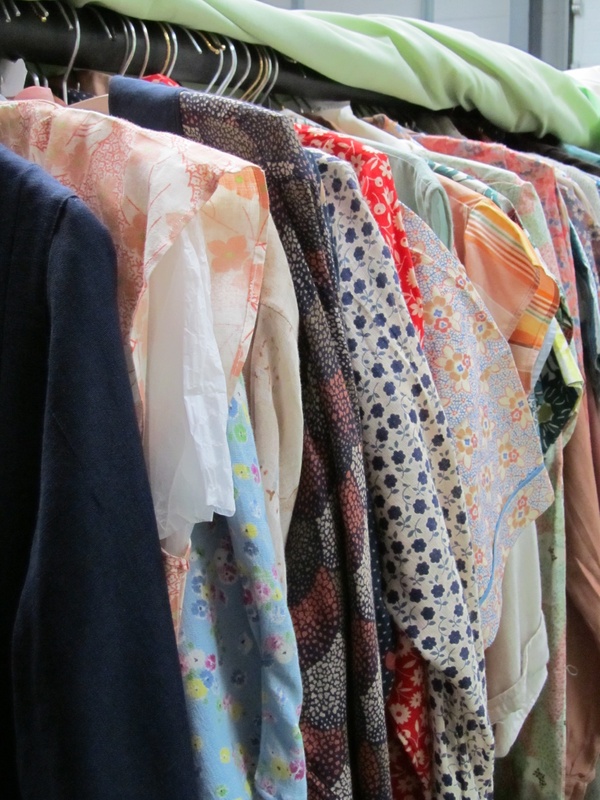 Conversely, the 1950s remained austere for many, with food rationing only coming to an end in 1954 (clothing rationing ended in 1949). 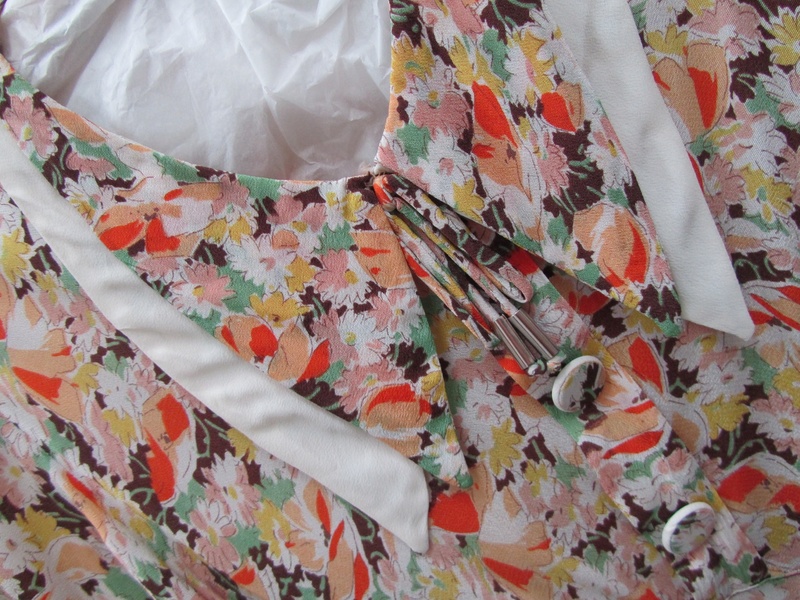 I reflected this by choosing a few unusual items: a ‘Wartime emergency pack’ of face powder, a surprisingly frilly utility dress, a distinctly dreary wool jersey dress from the 1950s next to a full-skirted confection of a dress from the same time. 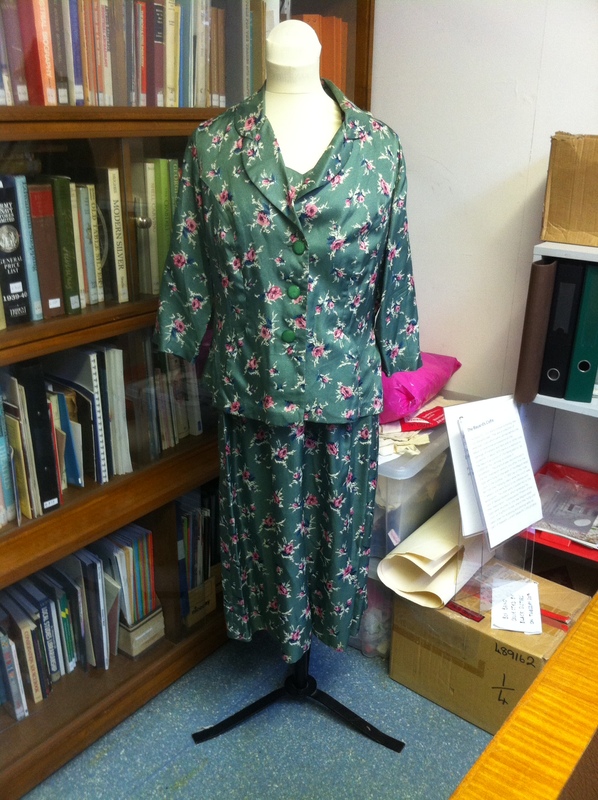 Utility items from the Hodson Shop Collection – creases have been kept in the dress as that is how it was discovered in the Hodson Shop. Installing the exhibition was great fun and an excellent learning opportunity. I’m really proud of the end result, especially the bit that includes a 1950s twin-tub washing machine! 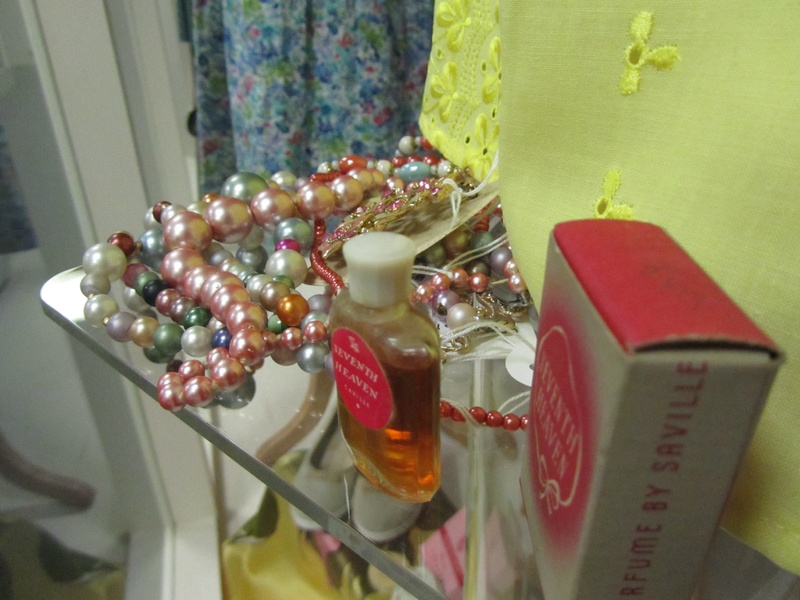 An abundance of pearls and perfume from the 1950s. 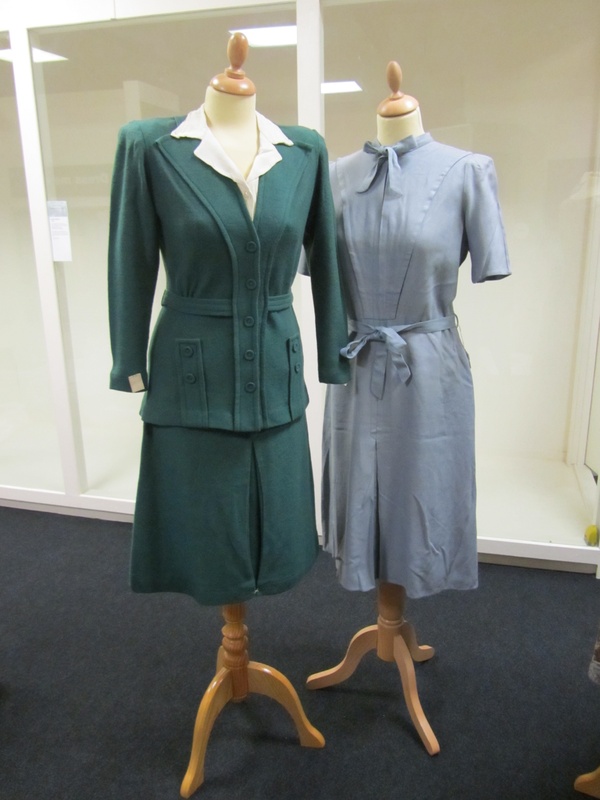 The clothing accompanies a display of items manufactured or used in the Black Country during the period 1940-1960, again reflecting the aesthetic and ideals of the shift from austerity to prosperity. 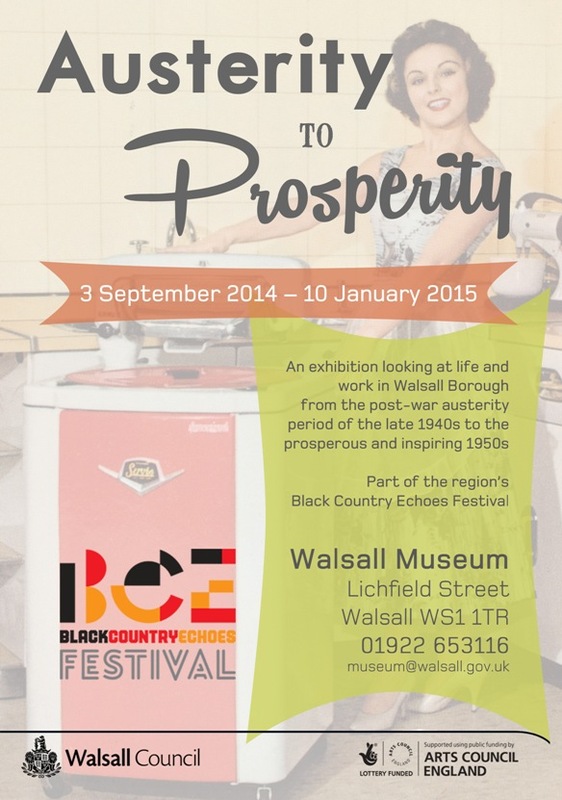 The exhibition is part of the region-wide Black Country Echoes festival and runs 3 Sept-10 Jan 2015. Admission is free. Thanks to the team at Walsall Museum for providing me with this opportunity and supporting me along the way! Community History Gallery, Walsall Museum, Lichfield Street, Walsall. Walsall Museum has been saved! As I blogged about previously, the museum was facing the threat of closure as part of a package of cuts by Walsall Council designed to save £19million. It looks like public support for the museum played a big part in the council’s decision, so massive thanks to those who took part in consultation and/or signed the online petition. 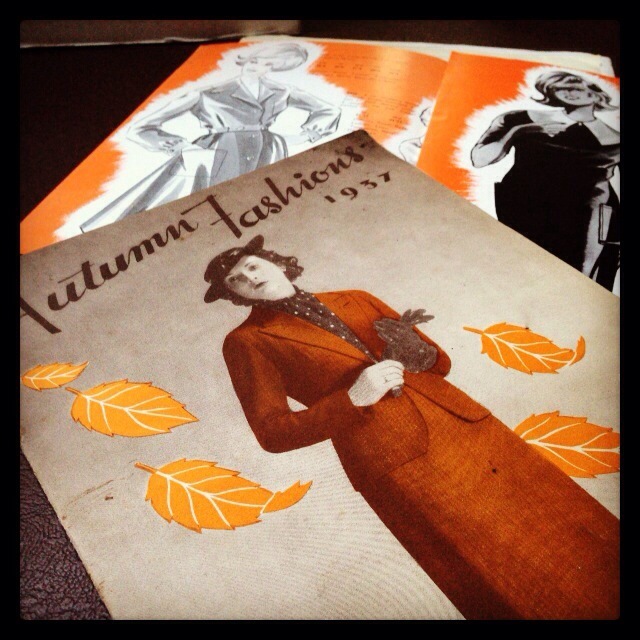 Whilst researching the history of the Hodson Shop Collection it has become clear that collections are subject to influences far beyond the display case or store room. The closure threat made this strikingly clear. 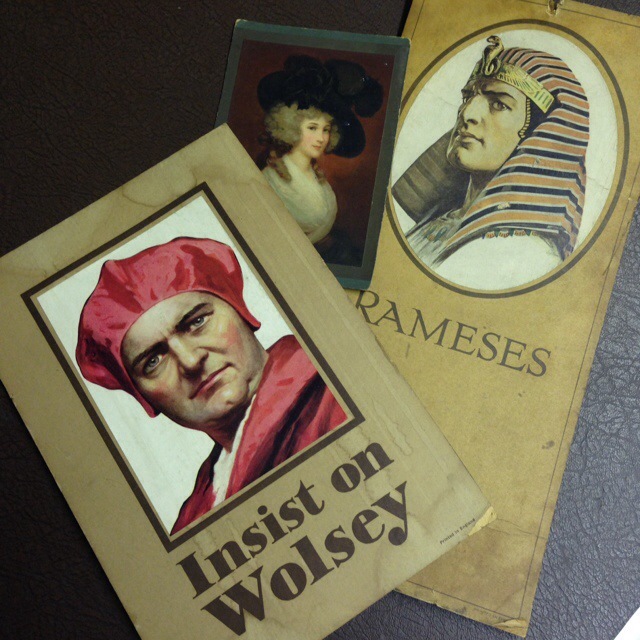 I’d like to take this opportunity to thank the team at the Walsall Museum for their ongoing support for this project – even during uncertain and troubling times. The current exhibition at the museum is Gaslight Gothic, which explores the darker side of Walsall’s history. It includes examples of Victorian mourning dress alongside tombstones, taxidermy and other odd and obscure items from the museum’s collection. The exhibition is in the Changing Face of Walsall Gallery on the first floor of the Central Library Building on Lichfield Street, admission is free. The archive contains invoices and paperwork as well as the catalogues and other ephemera. I have spent the past few weeks working my way through piles of invoices and delivery notes, searching for any links between the items listed and the objects that I have been analysing within the collection. 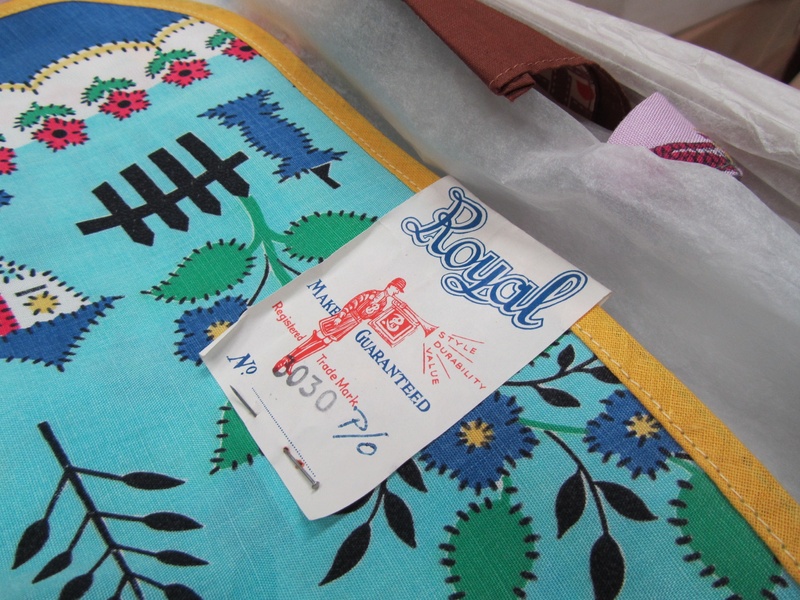 The aim of the process has been to build as full a biography as possible for the items. 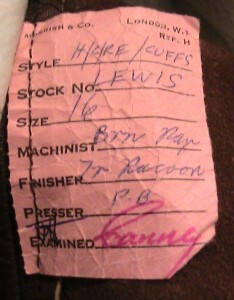 The invoices have the potential to answer a lot of questions. Where did an item come from? Who supplied them? How much did they cost? And when did they arrive? 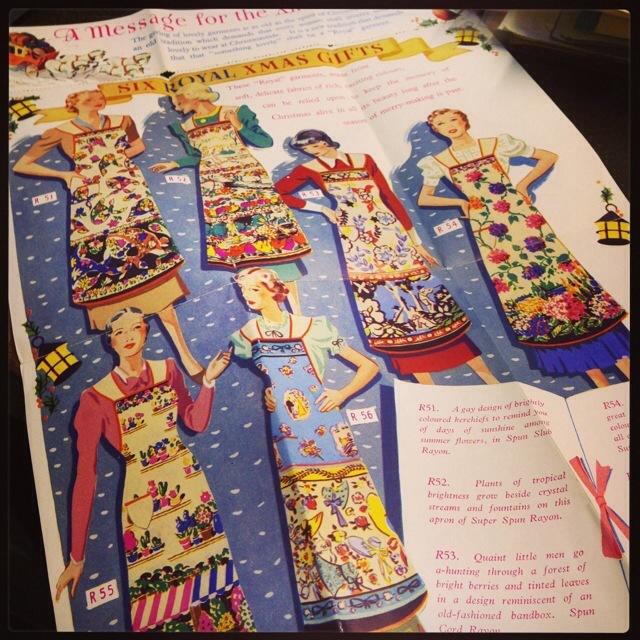 These answers can help to trace the life story of the items before their life in the Hodson Shop and Walsall Museum. 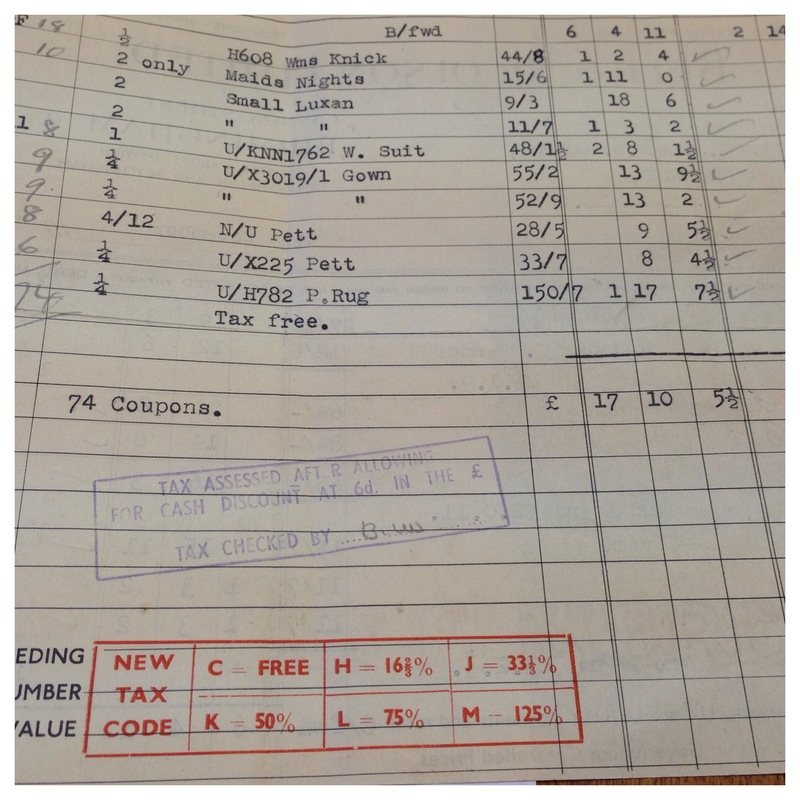 Invoice from Birmingham-based wholesaler, Bell and Nicholson Ltd., 1948. It hasn’t been easy. The invoices rarely give much in the way of descriptive detail – information regarding size or colour is a rarity and brand names tend to only crop up for specific items like corsets, hosiery and toiletries. There have been times when I have cursed the 1920s sales clerks for having such sloppy handwriting and not bothering to tell me the colour of a ‘frock’ ordered in 1923! Yet I have found some fascinating matches. 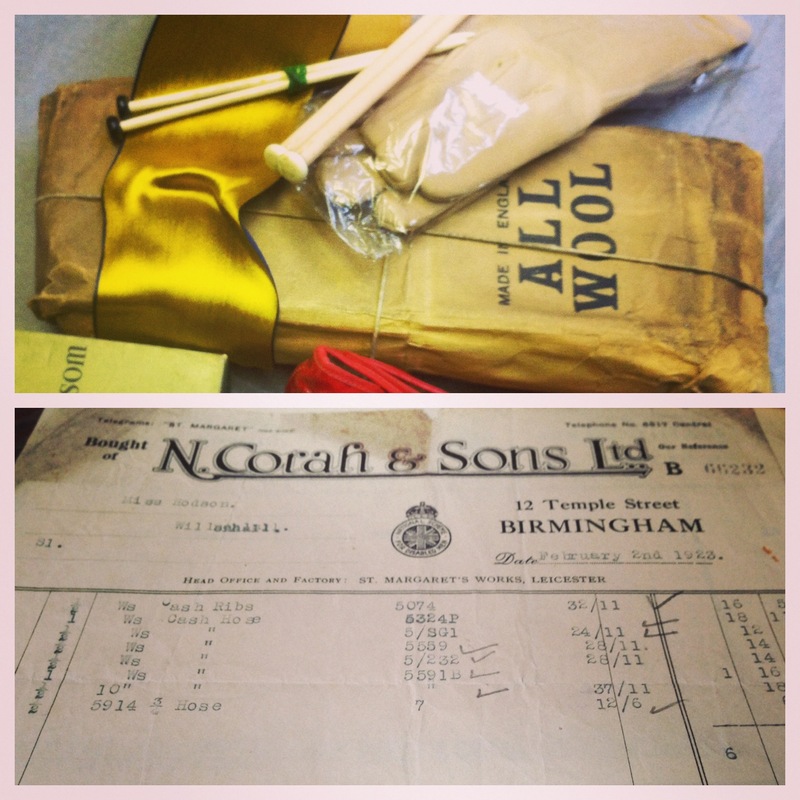 (Top) A parcel containing children’s cashmere hose (Bottom) An invoice from N. Corah & Sons Ltd., 1923 detailing the same hose. 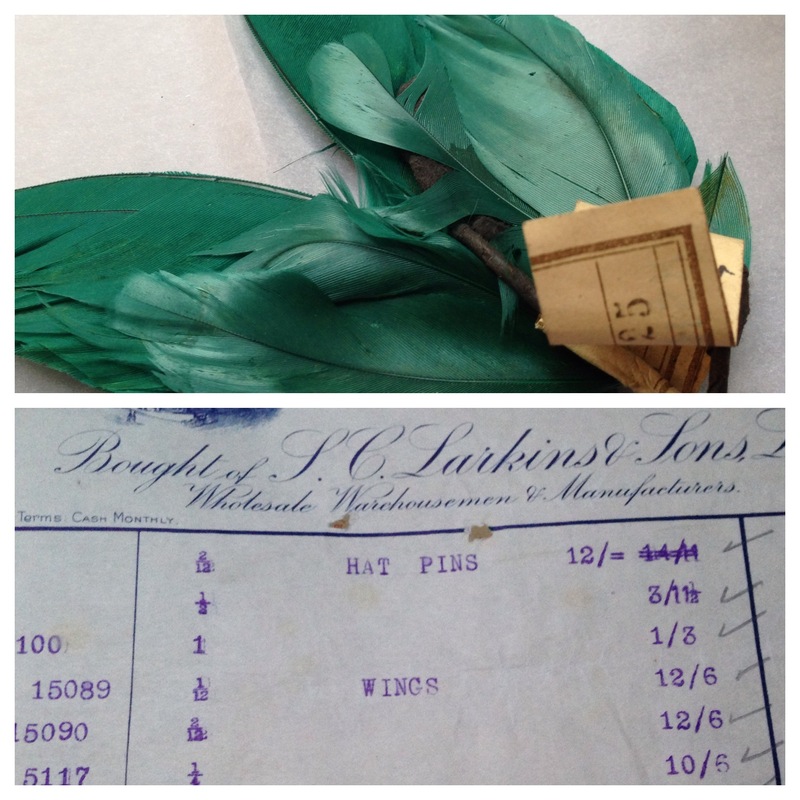 (Top) Jade green mock wings (Bottom) Invoice from S.C. Larkins & Sons Ltd., 1921 listing the same product. In both of these cases, I’ve been fortunate enough to have item codes to match up. Utility items have been slightly easier to trace, as have some items with the St. Margaret brand due to N. Corah and Sons being both manufacturers and their own wholesaler. 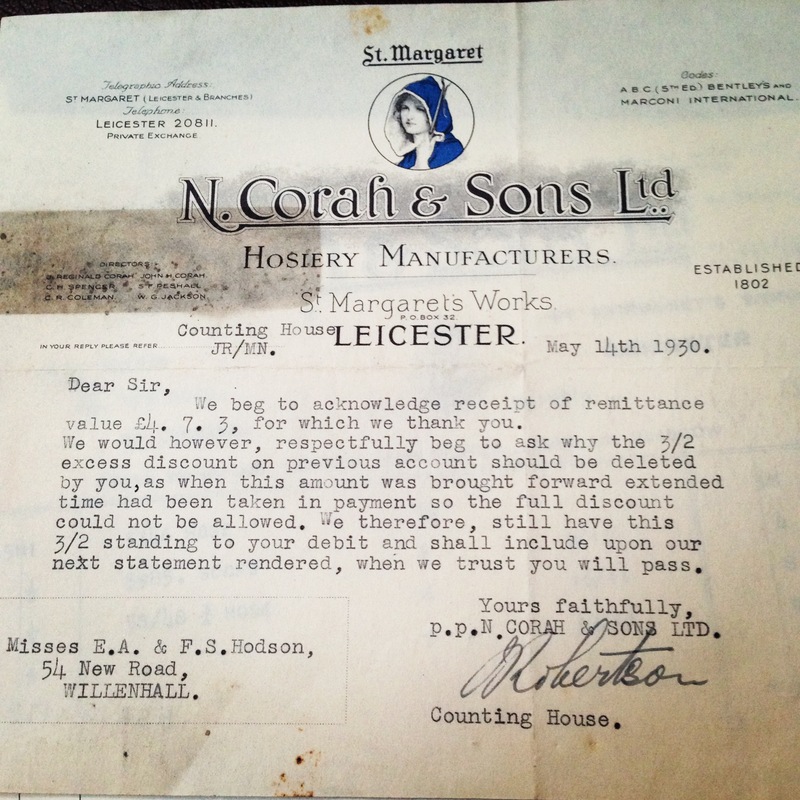 Letter dated 14th May 1930 from the ‘Counting House’ of N. Corah & Sons Ltd. Note the use of the greeting ‘Dear Sir’. Something that has struck me is how much stock was coming into the shop. Invoices from some of their major suppliers are often at weekly or two weekly intervals. I need to look into it further but my initial view is that they regularly over-bought, which provides an explanation as to why the Hodson Shop Collection is so large. 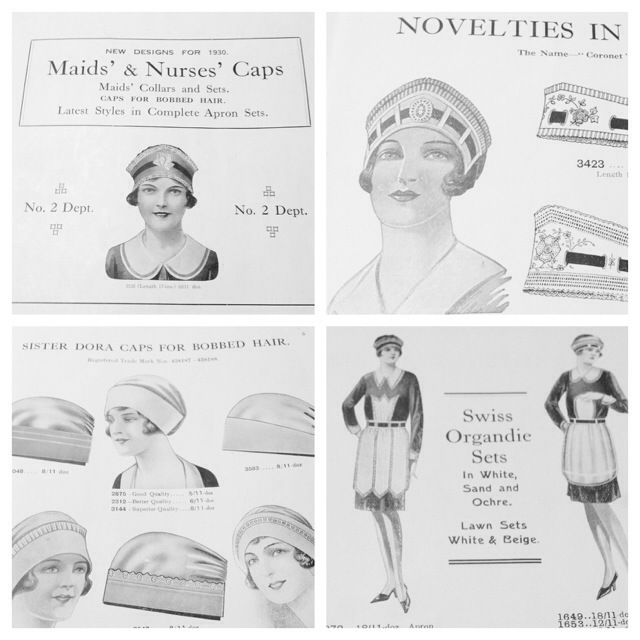 Another observation is that the sisters tended to only go to the trouble of returning items if they were from local suppliers, such as Walsall-based Ennals & Co. Ltd.. There are far more credit notes from this supplier than others. Maybe travelling to wholesalers further afield was too time consuming and too expensive? Or maybe their goods simply weren’t up to Edith and Flora’s standards? 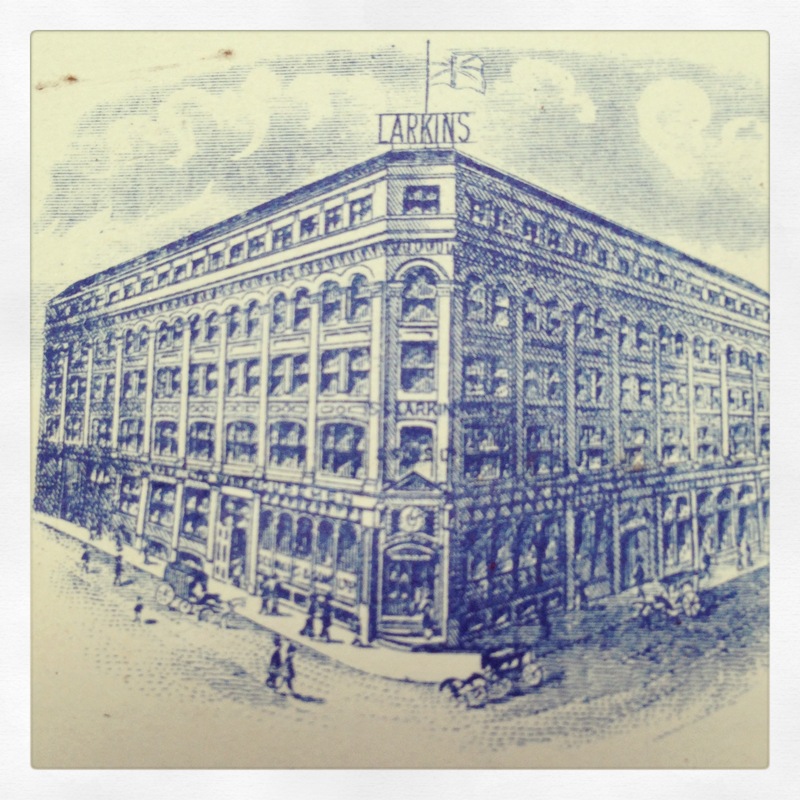 S.C Larkins & Sons wholesalers. Premises on the junction of Livery Street and Barwick Street, Birmingham. Image from 1920 invoice. There are still hundreds of pieces of paperwork for me to look through and I’m hugely looking forward to being able to cross reference my invoice findings with some of the links I’ve already made between certain items and trade catalogues. 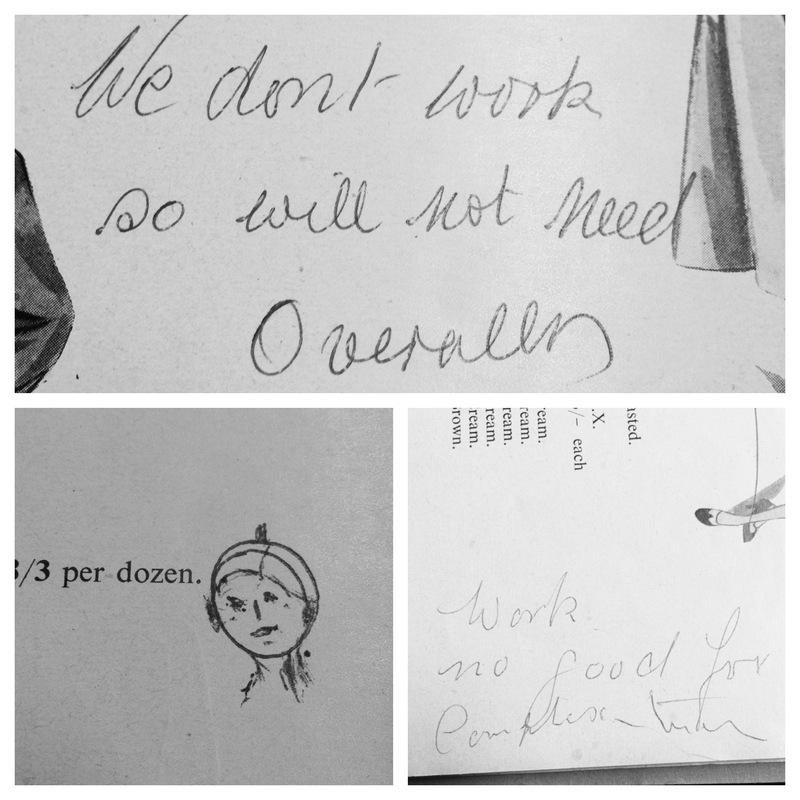 It has also been a thrill to see aspects of Edith and Flora Hodson’s personalities show through something as generic and functional as invoices. 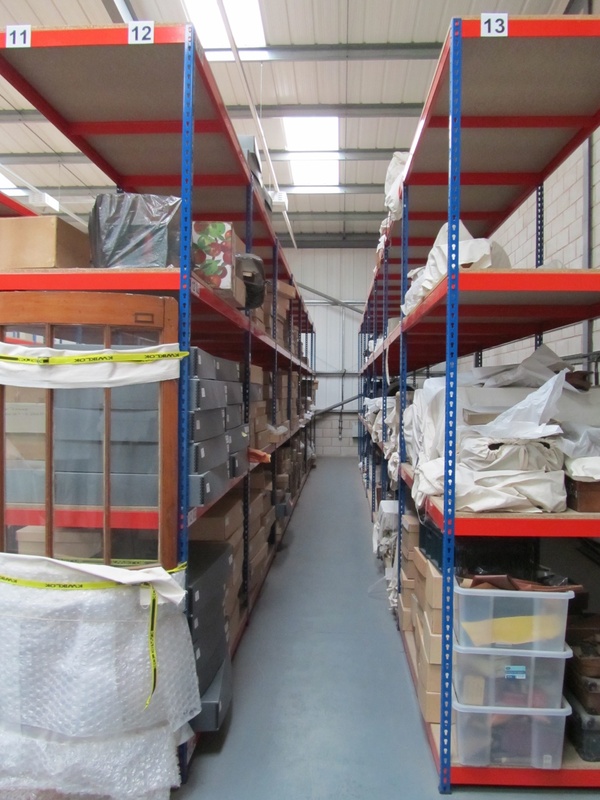 This isn’t just about the future of the Hodson Shop Collection, it is about providing a permanent and easily accessible home for the history of Walsall. Many thanks and a (slightly delayed) Happy New Year to you all!